This is the second of two interviews with Julia Galloway (the first appeared in the January/ February 2004 issue of Clay Times). The next column (scheduled to run in the May/June 2004 issue) will cover Galloway’s favorite glaze formulas and a series of photos showing her decoration process. Wilson: Let’s start with your telling us about the inspiration sources for your work. Galloway: What inspires me to make? I would say labor, the sheer joy of working. The private act of play, putting pots together slowly, watching things take shape. I am interested in objects-useful objects, the things that you keep around because they are useful and they have their own story, and they remind you of your story. They make your history, track your history, and help you remember and understand it. For whatever reason, I understand the world through things like mementos, relics, habits, and rituals. This cup in the morning, those stacking plates at dinner, that soap dish, this small box for my grandmother’s pearls. I know it sounds absolutely hopelessly romantic, but it is through objects that I mark the importance of certain things. It is less about the accumulation of these objects, and more about the stories that they carry. What do I look at? I look at things that have a visual denseness like Persian miniature paintings, with their architecture slightly askew and the color so amazingly dense against a brief pattern. That is how a day looks to me: dense, open, dense, open. I also pay attention to what I react to when I look through books or walk through a museum. I used to say that I was influenced by Islamic pots, and by Chinese pots (Song, Tang, and Ming dynasties), but it is hard for me to tell now. I like it very much when people say, “It looks like you are influenced by Isnik, or Betty Woodman, or Sevres,” but I cannot see this myself as clearly as a colleague can. I think 1’m a product of where 1’m from and the questions I ask. My mother is a poet, a free spirit, and I think-from her-I developed a stubborn sense of self. I think perhaps I am interested in the science and the study of domesticity-the objects around us that create our home, real or imagined. I am profoundly influenced by the work, beliefs, and theoretical discussions of Walter Ostrom, Alec Karros, Betty Woodman, Linda Sikora, Jeannie Quinn, and Mary Roehm. Sometimes I am influenced because I hear them discuss something, and it has put words to something I understood, but was not able to verbalize. I teach full-time, to a wondrous, curious, complicated, contrary, passionate group of students. I teach many different aesthetics, and my stubborn, solo aesthetic has become lucid over time. Wilson: Can you discuss your process in decorating a piece? Galloway: Decoration does not seem that linear to me. I know that I work out surface decoration on tumblers before launching into a teapot. But it seems to me that surface decoration is about always having one foot up in the air. First you decide-or accept-form, and then there are the throwing rings and process marks. What do you keep? What do the marks say? Then, there is lifting the pot off the wheel, and what is happening then, during transport. Then you look at the pot on the table, its first real-life contact. Next is soft leather, then the push and pull of shifting form from circle to square, or lobed or garlic-shaped, then hard leather, and the addition of colored slips. After that, it is the sudden graphics of one wet color next to another color that is less wet, luscious and leathery. Then there is bone-dry, and that nasty scraping, then bisque sanding, and glaze choices. Oh, it goes on. What I am most interested in is the ongoing potential. Often I get the same feeling making pots as I do when I walk through the library. All of the rows and rows of books, pre-existing knowledge, bound page to page, waiting for me to investigate as I run my finger along all the spines. That’s how pottery is to me: potential for discovery again and again. That is why I try and work the pots at all stages: soft, leather, bisque, glaze, re-glaze, luster. Wilson: What are your biggest mistakes? Galloway: My biggest mistake is just going through the motions of decoration, though it no longer has meaning to me on account of being stuck in my work or the demands of an exhibition. And, really, a mistake for me is getting hooked on working with lusters. I am always aware of what a toxic substance it is, but am not yet able to let its potential go. Wilson: If you could instantly change something about your work-and I will just casually guarantee total success-what would it be? Galloway: I wish that I could make these labor-intensive pots and sell them at affordable prices. In addition, often my pottery looks over-refined; I would love to get back a little ‘spaztiness,’ a little more ‘Pottery 101’ in them. Wilson: What happens for you when you unload a kiln? Galloway: When I unload a kiln, I end up liking the pots that I did not like at first. I didn’t like them because they were unexpected and I did not understand them yet. Later, those are my favorite pots. Oh, yeah, sometimes I make pots I think are really beautiful. I have a rule at school I try to follow: don’t judge your pots for 24 hours. Then, rip it up! Wilson: Have you used your own special system to figure out your glazes? Galloway: I try to start dealing with surface decoration when I am making, setting up situations in the pot that would allow me to re-enter the pots after the bisque. I do not finish the pot at leather-hard, but leave avenues open. In Canada, at Nova Scotia College of Art and Design, Walter Ostrom suggested that I glaze in the same manner in which I make. When I make pots, I work with parts, sometimes cutting pots apart and putting them together again, sometimes just squaring them off. I make pots with a lot of small movements, little decisions, one at a time. So when I glaze, I work in small areas, one at a time, putting together little movements, working around the pot. 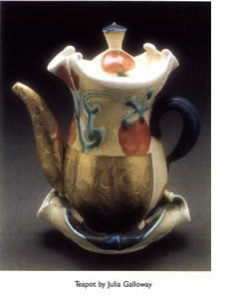 I work on surface decoration with many glazes; often they are close in color, with little difference in surface or hue. Wilson: As I recall, there is some great story about how you figured out color theory. Galloway: I didn’t know anything about color theory, or how colors went together. I had always had my head in the wood kiln, worshipping light brown, medium brown, and dark brown. I had a class with George Woodman, a wonderful painter and very sharp dresser. I thought, well, George really knows color. So on my class notes I would write what George was wearing, and then I would go downstairs and select my glaze combinations to match his outfits. It was a good place to start. Eventually, I bought a lot of fabric samples and wrapped my pots in them to see how color and pattern affected form. Wilson: How do you find inspiration when you feel stuck? Galloway: When I am a little stuck, I just make tumblers-a simple form-and I throw and throw and throw, and find some satisfaction in the labor. Usually that’s enough to get me going. I also look at other people’s work-any kind. It is better to see the real thing than a photo in a book. Sometimes, I just mix glaze tests, watch a movie, and go to bed early. Lana Wilson is a Del Mar, California handbuilder who teaches at Mesa College Extension, Mira Costa College, and gives frequent workshops. She is also author of Ceramics: Shape and surface. Visit her Web site at www.lanawilson.com.